I shop at Whole Foods several times a week and while I'm there I usually purchase something from their prepared foods section. They have an area for "oil-free" entrees and so I decided to try their raw kale salad with tahini dressing. I was so disappointed when I was eating it that I tossed it out. The raw kale leaves were so large (the size of the palm of my hand) that I had to tear them into smaller pieces while I was eating, or I would of choked. And the dressing was so thick and overpowered with garlic that it burned the back of my throat. I just don't know how they can serve a salad like this--I can't believe that someone in the kitchen tasted this and thought that it was good to go. And I've been back on several occasions and the salad was the same. Anyway, here's my version and you won't be disappointed. The salad is "oil-free" except that I added roasted chickpeas, roasted in a small amount of olive oil. 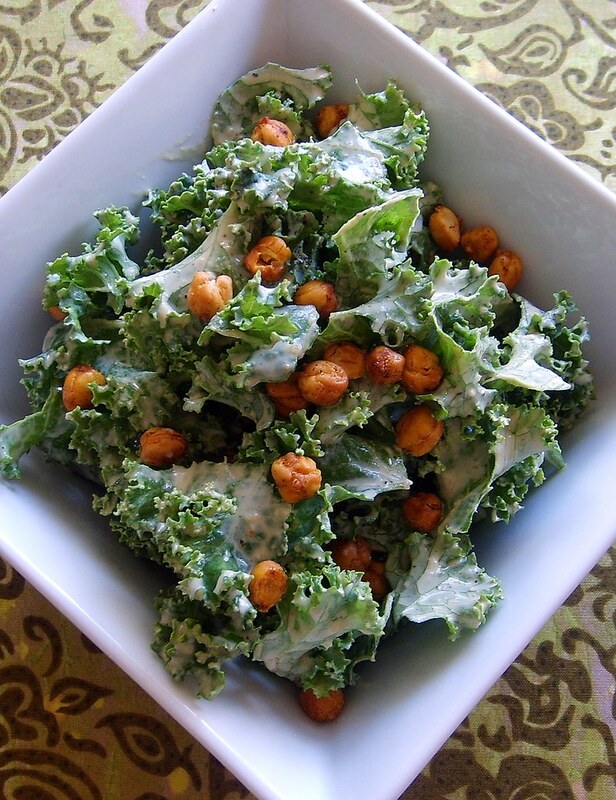 The chickpeas provide a nice texture to the salad and are good for you too. You can roast them without oil, if you want to keep it oil free. So Whole Foods, if you're listening, please re-do the recipe. I believe that people want to purchase healthy prepared foods, but they've also got to taste good as well. Add all ingredients, except for minced garlic to a blender or food processor and blend until smooth. Pour into a bowl and stir in garlic and season with salt and pepper. Soak chickpeas overnight and then cook until tender, about one hour. Drain, rinse and dry chickpeas really well, removing any skins that are loose. Preheat oven to 425 degrees and roast chickpeas on a sheet tray until dry and slightly crisp, about 15 minutes. Shake pan every five minutes or so to redistribute chickpeas. Turn oven down to 350 degrees and whisk together ingredients in a medium size bowl. Add chickpeas and toss to combine. Roast in the oven for about 20-30 minutes longer until golden brown and crisp. Make sure that you check them on a regular basis and shake pan to redistribute chickpeas. I usually set my kitchen timer for five minute intervals to make sure that I don't burn them, especially during the last 10 minutes of roasting, they can go from looking good to black in a couple of minutes. Remove sheet pan from oven and let cool. Wash kale pieces really well and dry in a salad spinner. Add kale to a bowl and add enough tahini dressing to coat the leaves lightly. Season with salt and pepper if needed and a squeeze of fresh lemon juice.